It has been a year since I paid a visit to a Belgian eatery in the Palisades neighborhood that served decent food, but, however, it left me uninspired to write a blog about their offerings. As I was about to scratch this cuisine off my to-eat-list, someone mentioned to me about another restaurant in the Maryland suburbs way up north of town which he raved about for its dishes and he insisted that I paid it a visit. 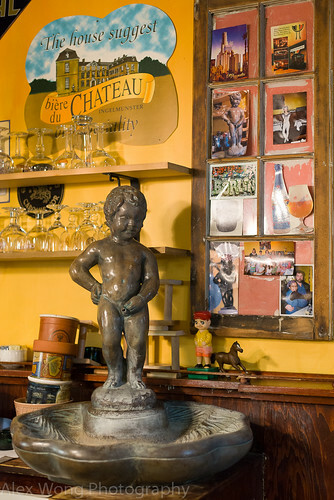 Mannequin Pis is located in the northern suburb of Olney, about 30 minutes north in Montgomery County, in a short nondescript strip mall that does not quite inspire much hope for fine dining. Located behind a larger strip mall and sandwiched other establishments serving fast and cheap eats, the establishment stands out with its patio furniture and the heavily decorated window front plastered with numerous dining awards. However, it is easily missed from the main road, but GPS is one’s best friend in this circumstance. With an online coupon in hand that spurred me to make a spontaneous visit, I walked in on a rather late hour on a quiet Monday night, hoping to avoid a large crowd (no walk-ins on the weekends) and to get a choice seat to take some decent photos for the blog. The place was only filled with a handful of people with French/Belgian music piping in the background. 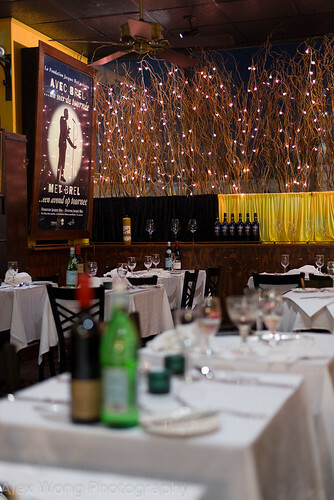 The dining room exudes some character with neatly set white paper and clothed tables filling the room without being packed like sardines. 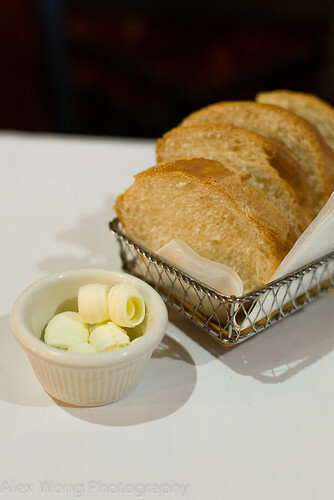 Upon taking my seat, I was served some fresh slices of baguette and butter. The quality of bread signaled what was to come for the rest of the evening. It was crusty and crunchy on the outside while spongy and light on the inside, exuding a homely baked aroma and tasting slightly sour from proper fermentation. This simple gesture was indicative of the attentiveness of this establishment, and anticipation was already stirring up in me. Perusing the menu, I was not sure where to start for an appetizer. Fortunately with the knowledgeable assistance of my Francophone waiter, he suggested that I order the Mussel Saffron Soup. When it arrived, I marveled at the bowl and its ingredients. 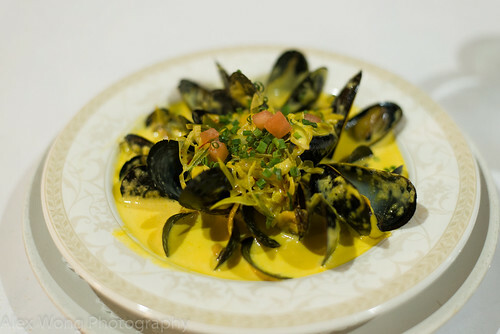 A pool of deep yellow soup arrived brimming with whole mussels topped with some chopped tomato, chives, leeks, and the unmistakable strands of saffron. But it was the flavor profile of the soup that really impressed me the most: the soup was slightly floral from the saffron threads, savory from a good seafood stock, made rich from the use of crème fraiche, and slightly tangy from a hint of cider vinegar (my suspicion was confirmed by my waiter). 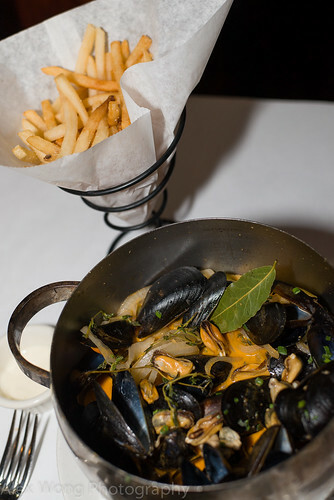 The mussels were plump and slightly briny, cooked to perfection while maintaining its fresh quality and plumpness without any granular texture (a telltale sign of inferior quality or overcooking). With this delicious soup being surprisingly light and so flavorful, I could not put my spoon down until every drop had been ingested and all the mussels consumed. It did not matter that summer has already arrived and this was a creamy soup – this could be a year-round order in my books. Recalling my previous experience in the other Belgian restaurant, it appears that one of the strong suits of this European cuisine is the sausages, and this restaurant offers a wide variety of these meaty morsels. Although my waiter recommended the Merguez sausage (made with spicy Moroccan lamb), I elected for something closer to its home and flavor – Wild Boar. 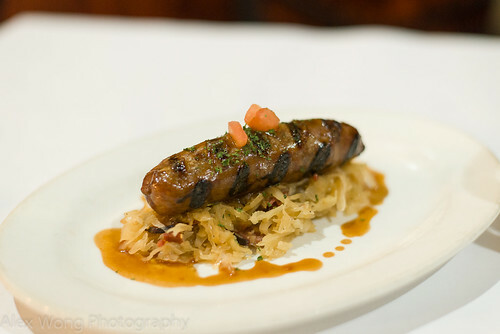 The encased pressed meat arrived grilled, judging by the burnt marks, perched on a bed of White Wine braised Sauerkraut. Biting in the meat, I detected its mild gaminess paired with a tinge of sweetness and clove aroma, studded with pieces of moist sweet raisins. What I liked about this bite was the freshness of the meat, the unique flavors of wild boar, and the gentle seasonings that elevated the meat mixture beyond its humble state. The pickled cabbage under was the perfect foil for the slightly rich meat flavors with its sour elements made complex with the slightly fruity wine notes and some salty smoked bacon goodness imparted into the pickle. This was definitely a good pairing for this tasty sausage. It would be amiss to take a trip to a Belgian restaurant without ordering what this Continental cuisine is known for – Mussels. I chose my mollusks paired with a weird sounding sauce – Snob. A mini cauldron pot arrived with a kilo load (more than 2 pounds) of the seafood, piping hot with the sauce made with celery, onions, leeks, lobster bisque, garlic and brandy. The liquid was rather rich and packed with flavor, made aromatic from the use of fresh thyme and fresh bay leaves (milder than the dry version) imparting their slight mint-woodsy and faint eucalyptus-like oils. The mussels were as fresh they come – plump, briny, juicy, and not granular which is indicative of their freshness and proper cooking. The side of Frites was decent and proper, served the continental way with a tangy mayonnaise as the dip. For the seafood lover, especially mussels, this is a must-order with a wide choice of 17 tasty sauces to delight each bite and the individual’s taste. Just when I thought I was sated from the delectable offerings, I was tempted by my waiter to look at the dessert menu. He suggested that I order Chocolate Terrine and I took it up on his advice. My plate arrived beautifully decorated with two thick slices of the terrine sitting on a zigzag pool of raspberry coulis. The chocolate wedges hit the right spot for this chocoholic – it was made with good quality Belgian dark chocolate (I was shown the 20-pound bar) that exuded its bitter-sour qualities of its high cocoa content. Beyond this flavor profile, hints of a slight Amaretto booziness came through along with crunchy shards of toasted almonds that added a counter texture to the smooth rich terrine. The sweet fruity raspberry sauce was the classic complement to the rich dessert providing more sweetness and fruity acidity to balance the chocolate. 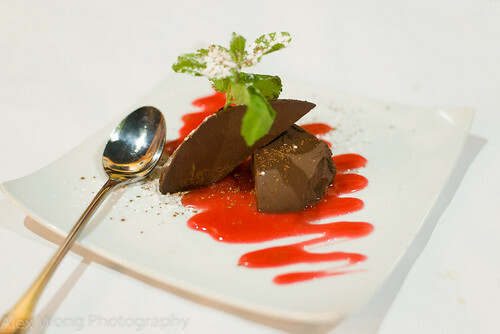 Again, we see the skillful cooking/preparation of the kitchen in this simple yet well-constructed dessert. It was definitely difficult putting my fork down with this decadent delight, but I managed to save the other half for another occasion. Three things come to mind: never write a cuisine off just because of one lackluster experience; do not judge the book by its cover, or a restaurant by its location or storefront; and listen to what people say and recommend for the word of mouth is a powerful tool. With these pointers in mind, I am glad that I have stumbled across this unassuming delightful restaurant that offers wonderful veritable Belgian cooking that can impress the skeptic. On my next trip, I will probably imbibe in the various Belgian beer offerings especially the raspberry one that my charming waiter recommended to go with my dessert. The good thing is that I won’t have to write a blog, hence I can put my brain cells on vacation for the next visit and let the alcohol do its giddy work on them! I think I could easily become a constant customer here after reading this review. And the foodtography always wins me over. Thank you, Gino. Great place for true Belgian cuisine.